The magical mystery tour is waiting to take you away. Roll up we've got everything you need. Well, the evening was magical and it certainly had everything I needed. I left BC Place Stadium last night feeling like I had indeed been on a magical mystery tour. 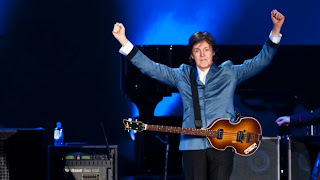 Paul McCartney took us from a blasting, fire-filled, sparkling, stage-vibrating rendition of Live and Let Die to a smokey, subtle, emotional piano solo version of Hey Jude. The shift was dramatic and the crowd went from rowdy to dreamy in five seconds flat. The 40 000+ people who were there swayed to the music, held hands with their loved ones and swayed side to side as almost each and every one of us sang along. I'm not sure what was in the heads of other folks at this time but for me Hey Jude brought back memories of junior high school. Awkward boys and aggressive girls hopped and bopped to the tunes at our school dances while everyone nervously anticipated that "last dance". It was always Hey Jude. It was so long. If you ended up with the boy or girl of your dreams you were guaranteed 6 minutes and 52 seconds of pure bliss. If you ended up with someone whose arms you didn't want wrapped around you it was the longest 6 minutes and 52 seconds of your life. That's how the whole evening went for me, from bouncing in my seat, clapping my hands and screaming like a 15 year old girl to wiping the tears from my eyes as memories and emotions flowed through me. I loved it all. Music does that to me. It winds me up and calms me down and last night the good-looking Beatle played me like one of those beautiful guitars he courted us with on and off through the three hours of solid hits he honoured us with. The Long and Winding Road was one of the first piano solos of the evening. The music was beautiful, and the words came back to the tip of my tongue oh-so-quickly. I'm not sure all of those who sat around me enjoyed my version but really, I didn't care. In fact, I sang along to almost every song, sometimes quietly and sometimes at the top of my lungs. Sometimes tapping my foot and sometimes clapping my hands over my head and hooting in between verses. My husband didn't elbow me and tell me to stop and nobody threw stuff at me so I'm thinking either they were singing along or they were wrapped up in their own memories. Paul took us all down a long and winding road last night and we loved him for it. It was the shortest three hours of my life and I didn't want it to end in spite of four curtain calls. We were taken through the crazy era of the British Invasion, honoured with Blackbird - a tribute to the civil rights movements and got to share a little of the love he had for both John and George. People waved their bic lighters (alongside their cell phones), pumped up their peace signs and screamed for more whenever he stopped. It seemed impossible that this 70 year old man could whip the crowd into a frenzy with a bit of a smile, that lazy Liverpool accent or memory-filled songs that we could all identify with. Yesterday, all my troubles did seem so far away. I was with people I love listening to music I love remembering memories I love. There were moments of pureness through the evening but I think my favourite was the piano solo of Maybe I'm Amazed. The original video shows a man and his family and it reflects how life was for our family at this time as well, all wrapped up in each other, living life simply with no real understanding of how quickly it would all pass. I loved this song when it originally came out but I love it more now. Special times are made more special by the people you share them with and I'm so glad I shared this evening with the people I did. It did my heart good to see my husband singing along with the rest of us (although much more quietly and dignified). It did my heart good to lean my head toward my sister-in-law's as we sang Yesterday. My husband's younger sister is still giving him the gears over his 1969 version of Yesterday and we all had a good laugh as we looked over to see if he was singing along with Paul last night. I had my own pictures in my head of my older brother shredding his air guitar and flipping his hair over his head as well. Music is all about emotion and last night we all travelled back in time and through a gamut of feelings. In the words of my grandson, "IT WAS AWESOME!". Lala how the life goes on. First comes love, then comes marriage. . .